From nuts, bolts, and springs to detergent caps and food products, parts feeders are an integral part of a successful automated process. Generally, feeder systems are measured by output rate, final part orientation, and system size (equates to floorspace). Vibratory feeders specialize in assembly processes and output rates up to and sometimes above 200 parts per minute, where centrifugal feeders are typically implemented in packaging applications and operate around 200-1600 parts per minute. Flex feeders and other specialty feeders fill in the gaps and vary greatly in output rate depending on neighboring equipment and part characteristics. Parts feeding describes just one of the endless number of specific processes required to automate the assembly and packaging of the goods consumers enjoy every day. For robots and pick and place mechanism to effectively assemble widgets, the parts must be presented reliably and undamaged. 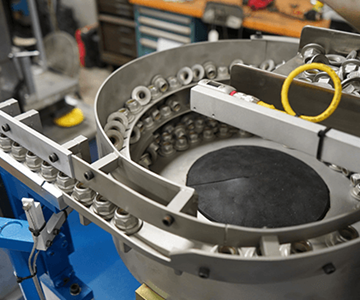 As production output and quotas increase, there is more and more emphasis on the functionality of these parts feeders, which is why it is crucial to optimize each parts feeder in its assigned role. Parts Feeders: A branch of automation equipment that takes in bulk, randomly oriented pieces to be assembled or packaged (parts), and gently manipulates them at a pre-determined rate to achieve a consistent feed of similarly or identically oriented parts. 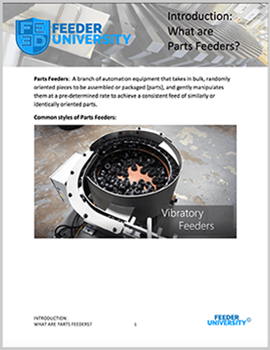 What kinds of parts do parts feeders feed? 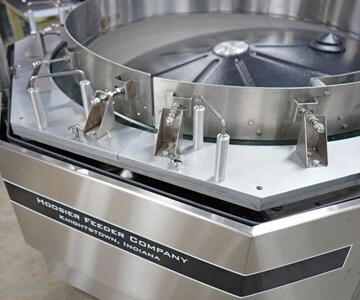 If you think you are in need of a parts feeder and are not sure whether or not your application will work, consult with the experts at Hoosier Feeder Company to find out the best course of action.